by Al -- YOU NEED A TRUCK! Let's say you need to pick up a dishwasher from your local big box store tonight...What are you gonna do? Are you gonna fold down the seats in your wife’s Sport (not) Utility vehicle? No...it wouldn’t fit in the scrunched down roof and bulky fold down rear seats “SUV” anyway… YOU NEED A TRUCK! If you are into any sort of sports, a bicyclist, horse enthusiast, kayaker, landlord, or do anything besides sit in your house all day, you can probably use a truck. 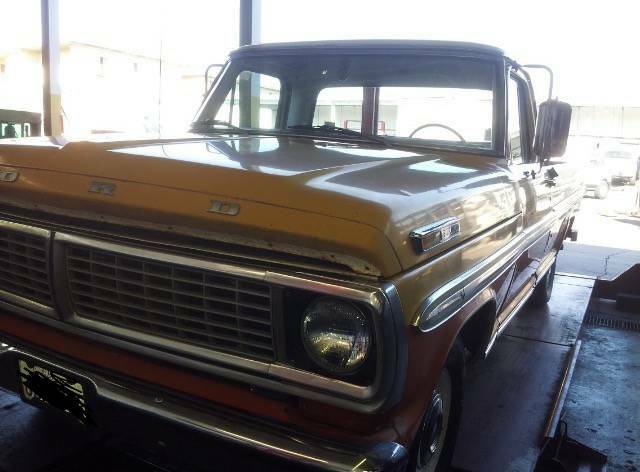 This 1970 Ford F100 offered for $3,300 in Alhambra, CA fits the bill to a tee. The owner posted several bad pictures of the truck. Even though no pictures show the complete vehicle (or even both headlights) You can gather that the truck was originally a white longbed repainted Medium Goldenrod (very popular early 70s ford color) on top, with red on the bottom. Medium goldenrod over the whole thing would have been very cool, and very period correct. This particular combo of Medium Goldenrod over red, with white metal still present in the interior isn’t the greatest, but it will work to keep other people parked far away from you. If you can get past the colors, you can piece together that the truck is pretty solid, and straight. Assuming it is originally from the Golden State, you can probably assume it is relatively rust free. 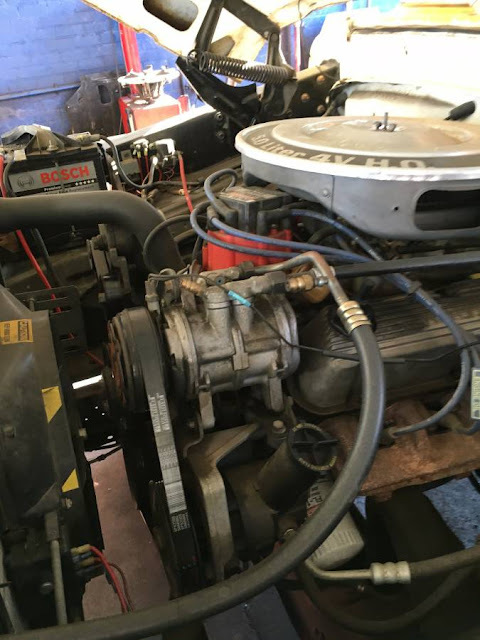 Moving on to the engine, the owner presents the money shot…A 5.0 V8. The valve covers, Air Cleaner lid, and Front end accessory drive all say the engine is out of an 83-85 Ford of some sort (maybe a Mustang). 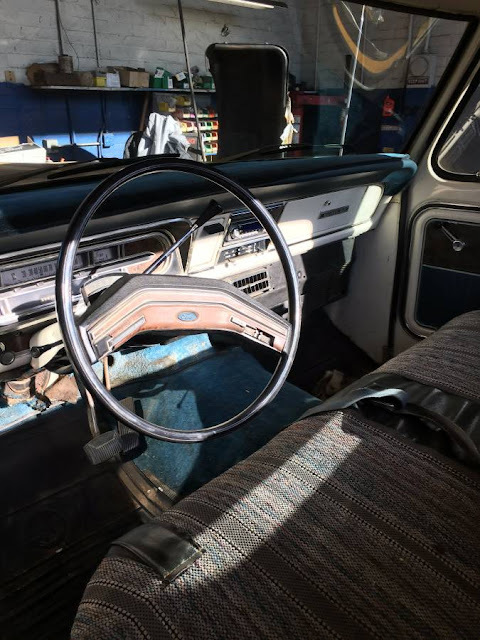 But even better than that…Power Steering and Air Conditioning are hooked up and functional! How cool is that? The engine has a DUI electronic distributor, electric fan and new radiator. The electric fan should be a lot quieter than an old school mechanical fan, and it should get you a couple more HP and a little better MPG to boot. At best, an ’85 Mustang engine would get you 210 HP…which is adequate but seems a little low compared to a Modern 268 HP V6 Camry…but so what? I’m sure the truck moves along nicely. 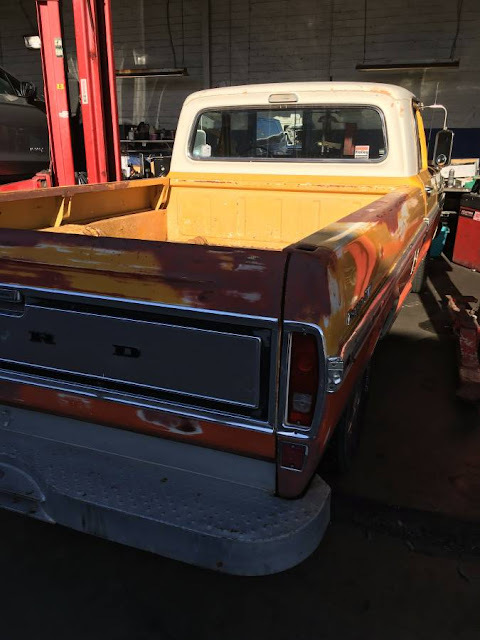 The owner states the truck has a 3 speed C4 trans, which could easily be swapped out for a 4 speed AOD with overdrive for good freeway drivability. The interior shots show all the original white paint, original steering wheel, blue carpet, black and blue door panels, and a generic seat cover. Places like National Parts Depot have entire catalogs devoted to ford trucks. 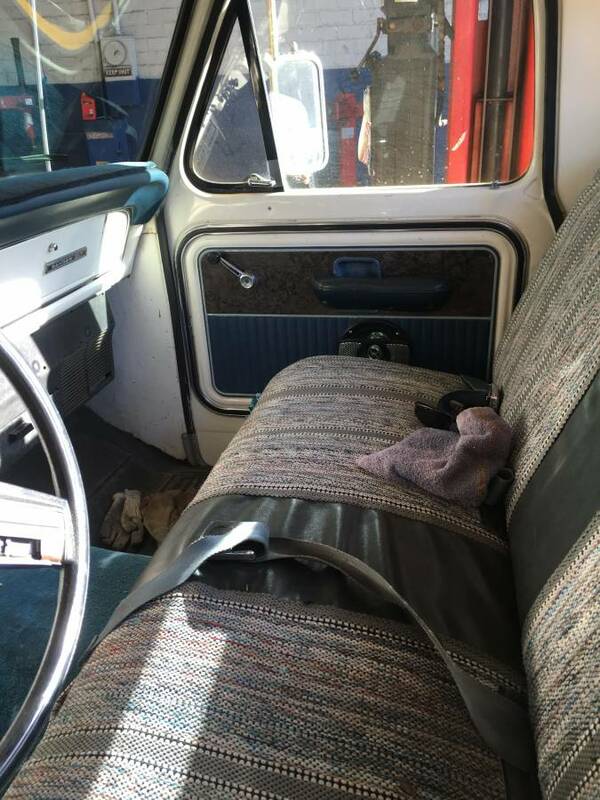 Some new vinyl seat covers, and carpet would make cool little projects, and completely change the tone of the interior. If this were my truck, the first order of business would be swapping out that C4 for an AOD. I kind of like the Medium Goldenrod color (I had a ’74 Maverick in that color), So I would paint the exposed metal inside medium Goldenrod, and swap in rubber floor covering and a nice fitted tan seat cover on the inside, and maybe spray over the red on the outside with the Medium Goldenrod. I wouldn’t get too carried away, as I would still want it to be usable as a truck. If this thing were a shortbed, it would be asking 3x the money, and be gone in hours. If you have a parking spot available, and don’t have a truck, you need to get this one. I beg to differ (as I do so often): you need a utility trailer and a hitch. Why drive a truck all the time, just because once in a while you need to transport something? You probably dont even need a trailer, a wagon/hatchback/cheap car with crappy paint and some ratchet straps will do almost everything most people need. And when you really do need a truck, Uhaul or Home Depot will rent you one for $20 for the day. That said, if you are going to buy a truck get something like this. Not so old that you can't use it but old enough to have character.